Cleaning make up brushes is probably the most dull of all beauty tasks but is also probably the most important. It increases their lifespan in addition to getting rid of all that yucky bacteria that accumulates in them over time (gross, but true). There are a multitude of ways you can clean your make up brushes. Over time, I’ve put a few to the test such as using regular old hand soap, whatever shampoo I had in my rotation at the time as well as the MAC Brush Cleanser for spot cleaning day to day. 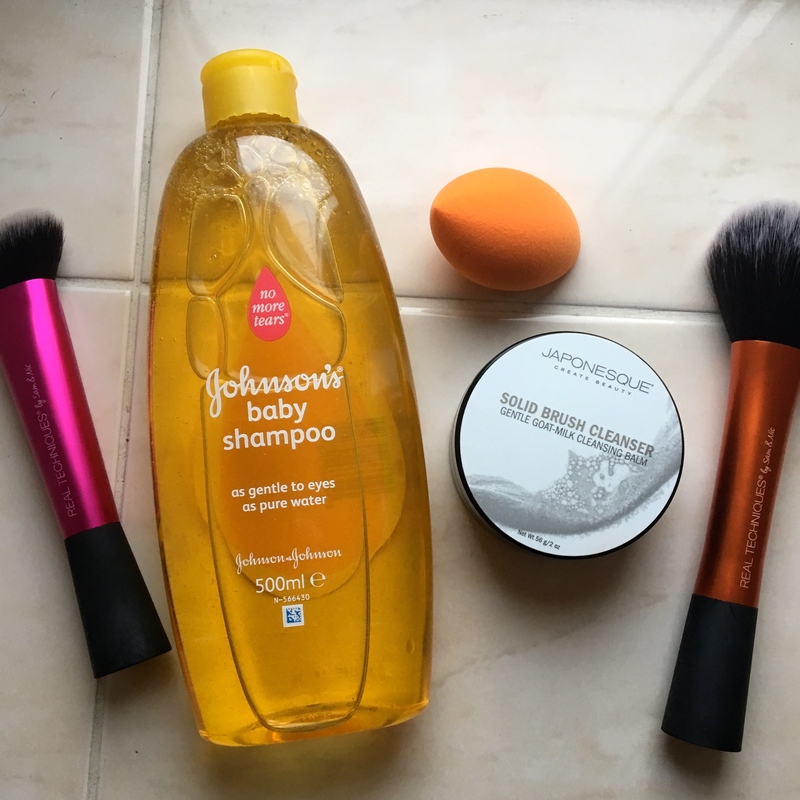 A few years ago I came across the Japonesque Gentle Goat Milk Cleansing Balm and something about it intrigued me enough to buy it – God knows why because it was £16 which is pretty pricey when it comes to something that is going to clean your brushes. But I was pleased I did. It was so easy to use, you simply wet your make up brush under the tap and then swirl it round the pot of solid soap till it foams up, and simply rinse off. Minimal effort required. The smell is also delicious – an unexpected luxury for a make up brush cleanser (although for £16 it was a welcome addition). It has a very fresh, “expensive” scent to it and also leaves your brushes feeling super-duper soft due to the added goat milk ingredient. I’ve made my way through many-a-pot of these over the years and one pot tends to last a good few months based around my weekly brush cleanse (does anyone really have the time to do it more than that??) but lately I’ve been after a cheaper alternative. That’s where Johnson’s Baby Shampoo comes in. I recently read an article that put multiple brush cleansers (including things such as hand soap and other shampoos and an idea as crazy as putting them in the dishwasher – not recommended!) to the test and this one came out top of the leaderboard. It was one of the cheapest per use (this 500ml bottle I bought cost £2 in Boots) and one of the most effective in removing all bacteria – 99.9% to be exact; most others lagged way behind in this. I also figured that if it’s gentle enough to use on baby hair, it should be fine for my synthetic-fibre and natural hair make up brushes. To call a spade a spade – yes, you can tell the difference between this and my £16 pot of goodness. It doesn’t leave the brushes feeling as soft and it also doesn’t leave them smelling as lovely (as nice as the baby shampoo smell is, once rinsed off it left no smell behind) and it involved a tiny bit more effort – I had to pour a couple of blobs of baby shampoo on per brush and it required a lot more rinsing in order to get all soap off so I did have to repeat the process a few more times per brush. But I would 100% recommend this if you are on a budget. It still left brushes thoroughly cleansed of all make up residue and the fact that it removes 99.9% of all bacteria leaves me feeling that little bit more confident. I can also imagine it lasts a bloody long time – cleaning all 732 (slight exaggeration) of my make up brushes with this barely touched the sides of the bottle. I’ll be introducing this Save vs. Splurge feature more throughout the next few months so stay tuned! Are there any budget or luxury versions of anything you’d like me to compare?! Let me know in the comments!